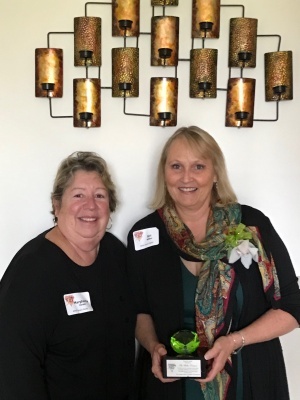 Siri Wilbur Kamien was recently named the “Emerald” winner at the Salem Chamber of Commerce and Salem Co-operative Bank’s 2017 Hidden Jewel Awards & Luncheon. The Hidden Jewel Awards were developed to honor the area’s priceless women, and the awards celebrate the accomplishments of women who have excelled in their field, shown dedication, and established themselves as involved leaders. The Emerald level represents hope and prosperity, and Siri was selected for her continuous work volunteering for the entire Windham community and lending a helping hand wherever needed. Siri’s charitable efforts include founding and leading the Gardening Angels in Windham, which looks to brighten up the “shady spots” in people’s lives by helping in their gardens. She is also president of the Garden Club and is on the Windham Town Common Beatification Committee, which is helping to create a “downtown” feel to the community. In addition to her public roles, she is known for working behind the scenes to support local causes and families. One recent example was her efforts to provide an Advance Mobility Freedom Push Chair for a local child, giving him a newfound freedom and hope to be able to participate in things that were previously not viable. Siri has been working in real estate for over 20 years. She is a graduate of the REALTOR Institute, a Senior Real Estate Specialist and she specializes in luxury and affordable homes.